Fork in the Road, or the little red short bus at Uptown Square. 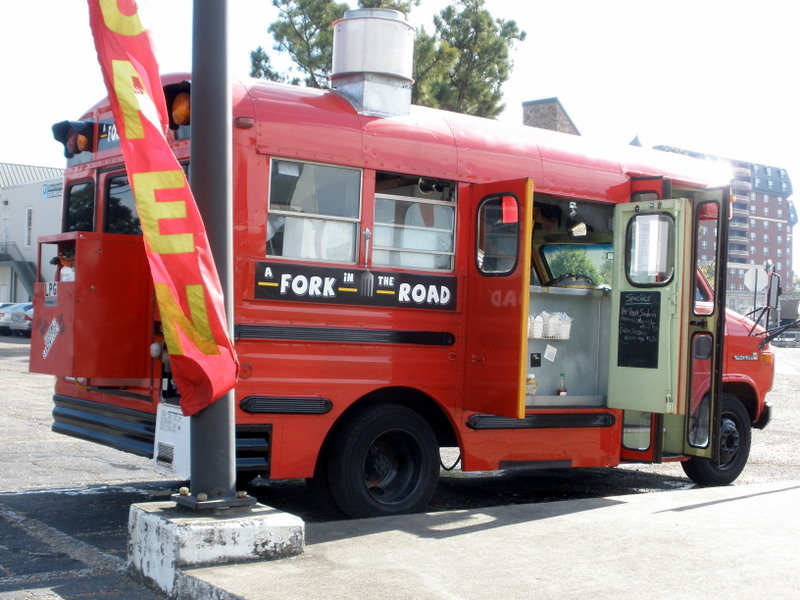 Tucked into a parking lot where Broadway meets Leake Avenue (aka River Road) near the site of the Tuesday Crescent City Farmer’s Market, Fork in the Road’s compact vehicle manages to contain a full kitchen. Look for two-fisted sandwiches, including vegetarian options, and a changing array of specials (like burgers on Tuesdays). Above are two daily special sandwiches, the cuban sandwich and “pot roast on bread”, as well as a veggie melt overflowing with roasted peppers, tomatoes, romaine, basil, goat cheese, and artichoke hearts. 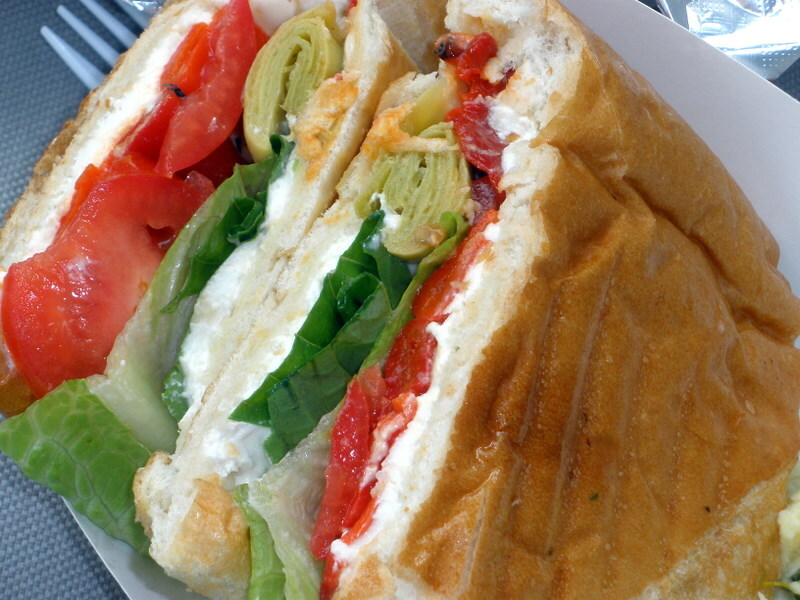 The sandwiches, served on pressed french bread, include rotating side choices of chips, potato salad, pasta salad, and a sweet, vinegary five-bean medley. Seating is limited to a single picnic table in the Uptown Square parking lot, but the levee and Audubon park are just steps away. 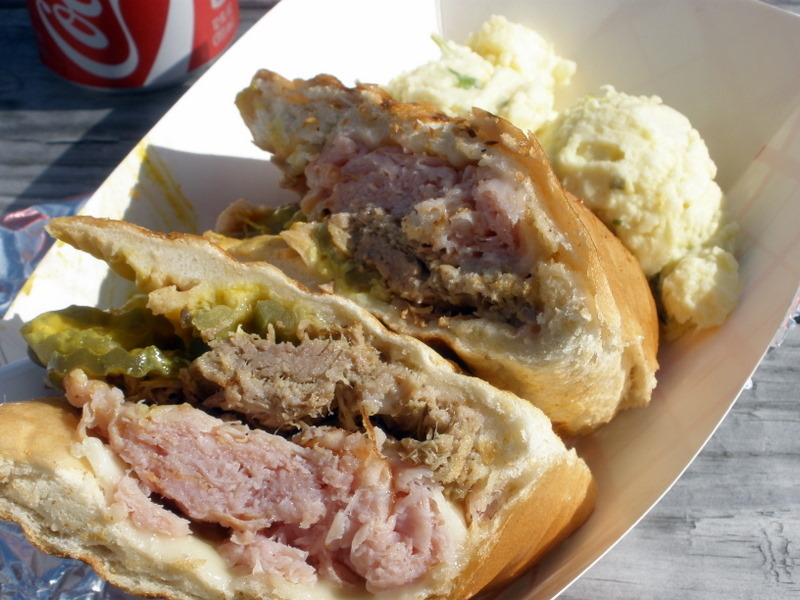 We’re getting some interesting food truck action too now, a new phenomenon. On Fridays at lunchtime several trucks park a couple blocks from my office. This is not an opportune time for my building because we are given free lunch on Fridays, but I had no trouble passing up precooked hamburgers for a food truck adventure. I went right for the cheese melt truck and had a roasted veggie with melted mozzarella. I would have used better bread, but it was tasty. I didn’t notice until after I ordered that one of the trucks offered Cornish hen gumbo, which I would have tried despite being skeptical of Arizona gumbo (well, it’s possible they know what they’re doing . . .). 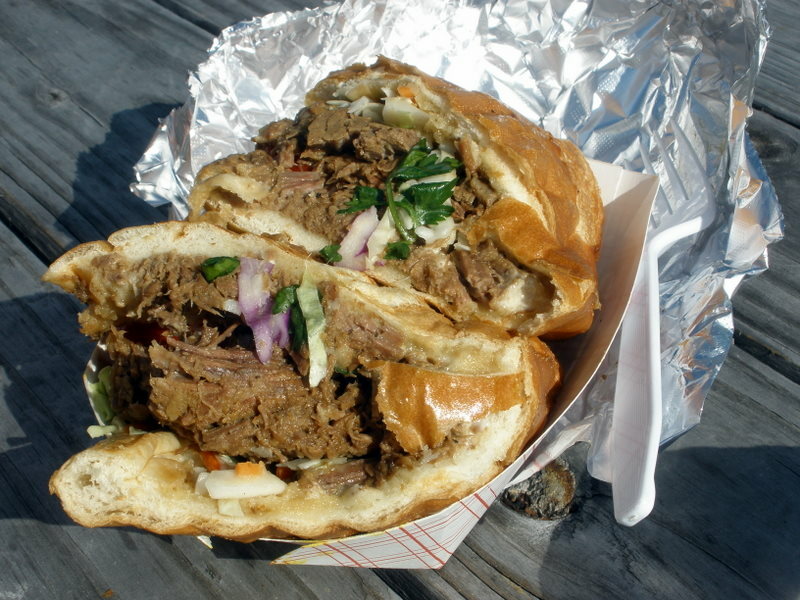 Other possibilities include hotdogs with unusual toppings, pulled pork sliders, so-called Asian fusion, mango ice cream. I don’t know where these trucks go at other times — probably to festivals and farmers’ markets. I love the concept. In the name of research, please sample the gumbo and tell me about it….gotta know about the cook’s geographic origins!